Good morning, America! Bethany, from Powell Brower Home, here filling in for Lindsay as she takes a much needed break. I'm the daughter (and Brower) half of the Powell Brower design team and I've been tasked with sharing my favorite room that I've designed. But first, a hearty thanks to our sponsor, Lindsay, for letting me take over the airwaves. She has a great sense of personal style and her home sure shows it, so I'm thrilled she's offered me a spot on her line-up. Along with Lindsay and 18 others, mom and I completed the One Room Challenge - a commitment to finishing one room in our house in just six weeks time. No halfway, no loose ends, straight up finishing something you started and doing it all the way. While that was just the fire I needed to get my rear in gear, it turned out to be my favorite room I've designed! We picked my master bedroom to complete for the challenge. 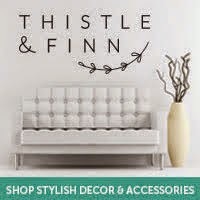 It's the space my hubs and I share most often, and it was so nice to put us first on the list for a change. It's like I gave him a present, too! (Who am I kidding, he doesn't care a hoot about decorating, but lucky for me, he goes along with just about anything). And here it is after some serious zhushing. Mom and I made the headboard about a month before The Challenge (or BC as we affectionately called it) out of a tablecloth I found on OKL. It wasn't my intention to use it for this purpose, though this isn't our first rodeo with a tablecloth (I have a canopy in my guest room and another headboard made from one). When it arrived, I didn't realize I'd ordered a rectangular one versus a round one for my large round dining table. 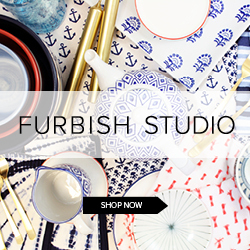 It just clicked for my headboard though, because it had that Les Indiennes and John Robshaw vibe that I lurve. We're a pretty animal-y bunch over here, so I wanted to pay tribute to my mom and grandmother with these pictures of each of us on our white horse (nice if I coulda straightened the frames for the picture eh?). My project manager, Wilma, oversaw the entire implementation. I bought some old corbels at Lucketts years back and always envisioned them as a shelf one day. They were in pretty rough shape, straight off of some Golden Age battle axe somewhere and definitely not trustworthy to bear weight. With a little elbow grease and a lot of stripper (that's what she said), we got them in usable condition. My brother tinkered with them until he found a configuration that worked to support any weight and we set them up to hold the TV components. Yeah, I know... we shouldn't have a TV in the bedroom. But there are a lot of midnight Deadliest Catch marathons on our schedule. We use my grandmother's old Waterford lamp for reading light and we updated the black paper shade with a neutral burlap one and I added some dip-dyed silk ribbon detail to tie in with the ceiling. I love how it looks like four different colors and matches both the drapes and the ceiling. The rug feels amazing on your feet first thing in the morning and does a bit of work to pull down the traditional vibe that the curtains have going on. I love off-beat color choices, so I couldn't resist bright coral velvet with the smokey gray-brown ceiling. And our new overhead light provides the most wonderful ambient light. I had our workroom make a roman shade out of a curtain panel I found at World Market for super cheap. 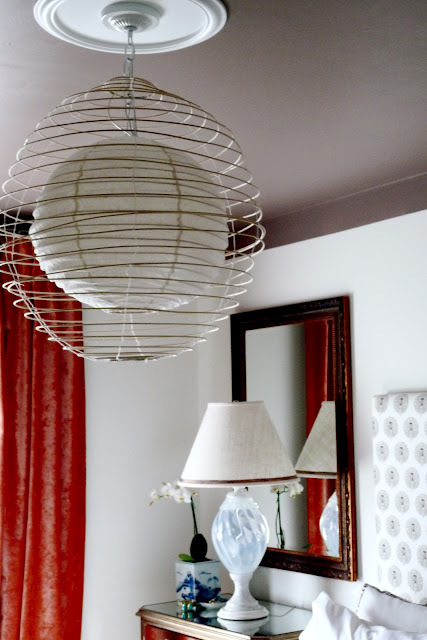 The texture and the jute lines mirrored the rattan pendant light so I had to layer it in. I love how the morning light comes through the sheerness of the fabric. The chunky wool throw was a prize I won for being a stalker. True story. I stalked this thing on Anthro's website until it dropped to a price I could afford, and just when it registered a hair under $100, I clicked BUY. As luck would have it, the power went out just as I clicked 'purchase'; a byproduct of heavy snowfall that winter which had me housebound and doing some damage online. Heartbroken and sure I missed the boat, I logged back on to see to double-check and miraculously, it had dropped down even further to $49.99. Thank you God. We painted the ceiling with Smoked Oyster by Benjamin Moore and dropped it down onto the walls to trick your eye and make my standard 8 foot ceilings look mysterious. It's the most cozy thing ever, perfect for creating a cocoon to sleep in. Although, as mom aptly pointed out, people who have a hard time waking up (ahemmmm) should not paint their ceilings dark. The walls are Dove Wing, also by Ben. I have a lot of mirrors around the room. I'm pretty vain. 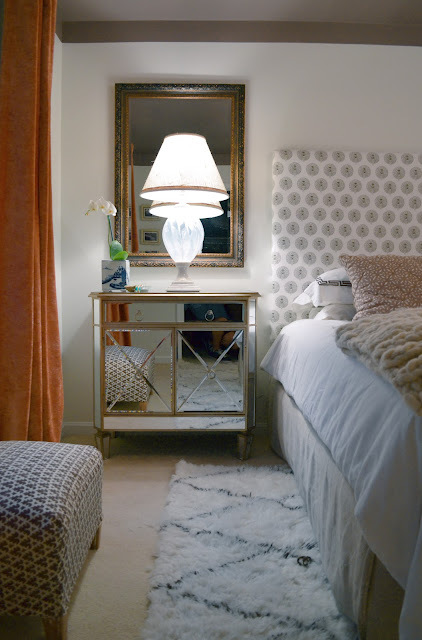 Actually, I used the mirrors in conjunction with the mirrored chests to amplify the light from my table lamps. With only one western facing window, I get poor light in here. We recovered the ottoman you see on the left with some Quadrille fabric I found on eBay for a song. I heart any and all things Quadrille, so I was quite happy to find this gem to recover Wilma's stool with. Sometimes a gal just needs a little extra help to get up on this tall bed. 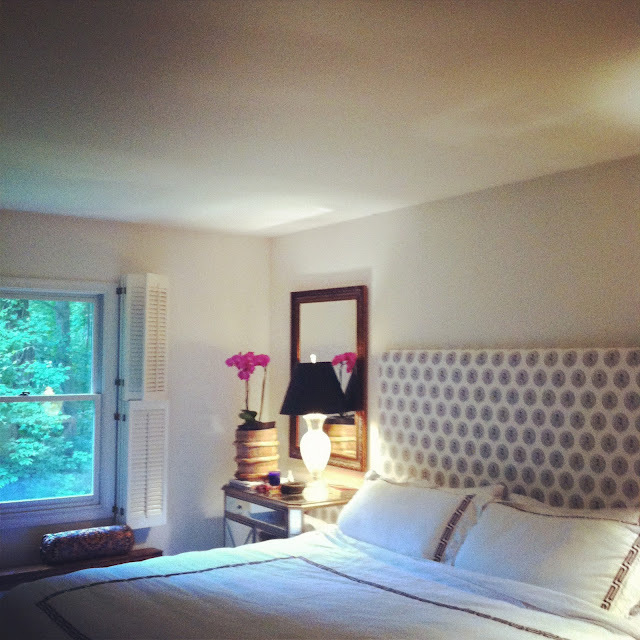 And there you have it, my [new] friends, my favorite room - my master bedroom. Thanks again to Lindsay for hosting me and to you, dear readers, for indulging me. Please pop on by to see us sometime at Powell Brower Home! We're always sharing our newest client project or whim around our homes and we love meeting new friends. Great use of corbels probably one of my personal faves in the room. Also-love the mirrors behind your reading lamps - genius! - Lindsey of Peaches Burlap Sack. Great transformation. Every project has a manager dont they?? Wilma has won my heart. You know how much I love doggies, and Wilma speaks to me, lol. Love your bedroom. Y'all did a wonderful job. what an informative post...with great results. I love it. I need to know more about that wallpaper out in the hallway though!! Beth - it's actually just stencil Mom and I whipped up on boring winter sunday. We made a two part stencil out of acetate folders from Staples and then used half a mason jar of paint, watered down so it would look handpainted. I was just going to ask about the throw. Great score, B! And you know how much I love your room! I keep scrolling up and down. Great job! 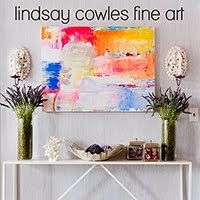 Thanks for having me, Linds :) So nice to be part of your special blog! WOW!! What an amazing room. I am so envious as the master in our house is desperately in need of some tlc. This inspires me A LOT! I super love this room! My poor master needs some lovin! 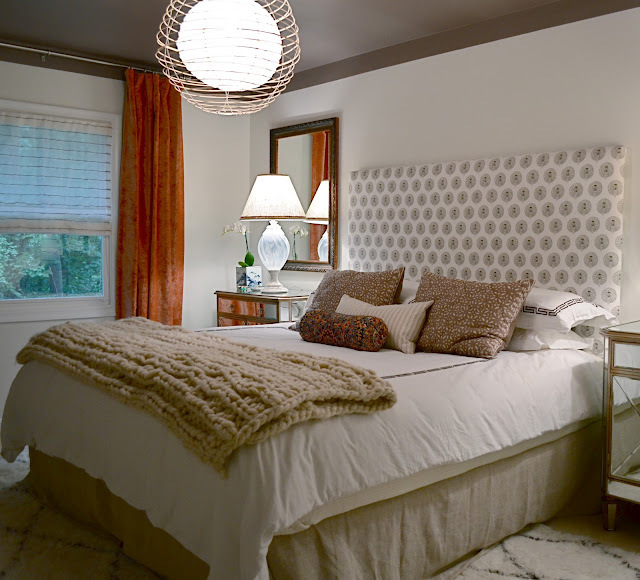 The wool blanket is gorgeous and I would love to see more of that wallpapered/stenciled hallway. I'm totally speechless. This room is to die for! You should have it featured in magazine! Can't get enough of this room Bethany!! And I could just squeeze Wilma - so cute! Great job, ladies. I think Wilma is the break-out star. Love the throw and the story behind it. This bedroom is just so impressively put together. It needs to be professionally photographed and published. Bethany is so talented. Thanks for sharing, Lindsay! I love this bedroom! Bethany did an amazing job in our ORC! !